Justin Hayward is best known as the leader of The Moody Blues. He began to record solo in 1975 and he had his greatest success with this 1978 single Forever Autumn from this musical adaptation of the H.G. 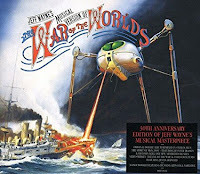 Wells science fiction novel War Of The Worlds. Hayward was born Oct. 14, 1946 in Swindon, England. In 1966 he replaced Denny Laine as lead singer of The Moody Blues and of course he was lead singer on all their hits. When The Moody Blues went on hiatus in 1974, Hayward recorded the album Blue Jays with Moody Blues bassist John Lodge and producer Tony Clarke. They had a top ten hit in England with Blue Guitar which Hayward recorded with 10cc. In 1977 Hayward released his debut solo album Songwriter. Then he was called to work on this musical version of War Of The Worlds. Jeff Wayne was a jingle writer who produced the David Essex hit Rock On. He got the idea to do a progressive rock version of War Of The Worlds. After Richard Burton agreed to narrate, Wayne signed with Columbia. He brought in Hayward, Essex, Chris Thompson of Manfred Mann's Earth Band, Phil Lynott of Thin Lizzy and stage actress Julie Covington to sing. The musicians were mostly veteran session men like Chris Spedding on guitar, Herbie Flowers on bass, Ken Freeman on keyboards and Barry Morgan on drums. Veteran songwriter Gary Osborne wrote the lyrics and Wayne wrote the music. Forever Autumn was based on a Lego jingle that Wayne wrote in 1969. Osborne recorded it with Paul Vigrass in 1972 as Vigrass and Osborne. Hayward's recording of Forever Autumn was a top five hit in England and top 40 in the US. The album performed well and Wayne took it on tour. He's turned it into a cottage industry as he continues to release versions of War Of The Worlds on CD, DVD and on tour. Hayward appeared on a couple of the tours. But he mostly concentrates on his own music. You can get Forever Autumn on some Moody Blues comps. But War Of The Worlds is one of those albums that should be heard on its own. And it is available on CD. Here's Justin Hayward performing Forever Autumn on Top Of The Pops 1978.